Climate change stands as one of the most controversial global challenges, often pitting the European Union against the rest of the world in what measures should be taken and who should pay for them. Yet even the effectiveness of EU policies is in doubt, with its market-based Emissions Trading System (ETS) struggling and efforts to extend the scheme’s reach to international aviation on hold. Weather volatility headlines are often held up as proof of climate change: melting glaciers, catastrophic weather events like the recent flooding in Central Europe, killer cyclones in the United States, and droughts that have raised doubts about food security. There is also mounting scientific evidence. “The climate change debate is a good example where the mainstream consensus opinion is that things are happening that will be adverse unless corrective action is taken [and] from a scientific perspective that principle holds,” said Mark Ferguson, director-general of the Irish Science Foundation. 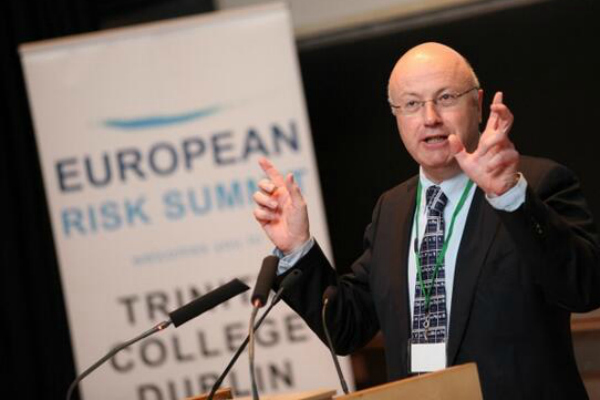 “The debate is what action we need to take,” he told EURACTIV at the European Risk Summit in Dublin. So far, there is no clear consensus on remedies and post-Cold War efforts like the 1997 Kyoto agreement to reduce greenhouse gas emission have been met with scepticism despite concerns about the risk of inaction. The United States, for instance, never ratified Kyoto and Canada withdrew from the protocol in 2011, citing the economic costs of reducing annual carbon dioxide emissions below 1990 levels. Developing countries won concessions at climate talks in 2010 to have rich nations pay for the shift away from fossil fuels through the Green Climate Fund although it has struggled to raise cash. Christiana Figueres, the UN’s top climate change official, recently told international negotiators in Bonn that they needed to speed up climate talks if they are to meet a 2015 deadline for a new agreement that would come into force in 2020. Those talks suffered a setback on Tuesday (11 June) when Belarus, Russia and Ukraine blocked further work by one of three key technical committees involved in climate change talks that began in the former German capital a week earlier. The move could slow progress before the next round of climate talks in Warsaw in November. This week, the Paris-based International Energy Agency (IEA) – a body known best for its forecasting and market reports – warned that governments need to adopt new energy policies if the world is to limit the world’s temperature rise to 2° Celsius, the threshold level that is seen as avoiding climate upheaval. But the report – Redrawing the Energy-Climate Map – shows the world is on course to exceed that marker. “Climate change has quite frankly slipped to the back burner of policy priorities," said Maria van der Hoeven, the agency’s executive director. Still, concern about the economic risks is seen as a roadblock to progress, underscored by Canada’s decision to renege on its earlier endorsement of Kyoto. The economic growth argument blocked significant progress at the 2009 Copenhagen climate talks, and last year, emerging and developing nations teamed up against EU efforts to seek binding sustainability targets at the 20th anniversary of the Earth Summit in Rio de Janeiro, Brazil. The first post-Cold War Earth Summit produced landmark environmental agreements on biodiversity, climate change and desertification, opening the door to the Kyoto Protocol on climate change that is to by succeeded by the new framework agreement in 2015. The Rio event produced no major binding deals and the 100 leaders attending signed off on a conference document – The Future We Want – that was negotiated in advance. Ferguson, who is also the chief science advisor to the Irish government, said the scientific evidence was “almost irrefutable” that human activities are fuelling climate change, including the use of fossil fuels and intensive agriculture. “A good principle in addressing situations – whether it’s looking at drugs, food, climate, natural disasters or what have you – is that the greater the consistency and the coherence of the evidence and the analysis, the lower the likely that the principle conclusions derived from it will be overturned,” he said in a speech at the European Risk Summit. But he said it was up to politicians, not scientific advisors like himself, to make the hard decisions on what policies should be pursued. Extreme weather events are rare, which means that statistics are not always available analyse them. But a 2012 extreme weather report by the Inter-governmental Panel on Climate Change (IPCC) found it probable that the incidence of heat waves and floods had increased in recent years, although there are strong regional variations. A rise in extreme coastal high water related to increases in mean sea level was also rated at between 66%-90% probability. The IPCC’s scientists also expressed confidence that droughts were becoming more intense and longer, particularly in southern Europe and West Africa, but in central North America and north-western Australia the reverse seemed to be happening. With 16+ years of no warming despite rising emissions of CO2 and no empirical proof of its effects on climate, there is no “irrefutable evidence” of anthropogenic global warming. In fact, all the paleoclimatic data makes clear that atmospheric CO2 level changes follow temperature variations, not the other way claimed by the hypothesis proponents. It is no science here, but ideological scam. Climate change is real but not as real as these same scientists love to say comet hits are; “inevitable”. Sooner or later these fear mongers of climate blame (including you lazy copy and paste news editors) will face some sort of criminal charges hopefully for uttering your irresponsible CO2 death threats to billions of helpless children and contributing to 28 years of needless CO2 panic. For the record; science has NEVER said any crisis WILL happen, only might happen and it’s been 28 years of a “maybe” crisis. They agreed it might happen, not will happen. How close would the lab coats have taken us to irreversible warming before they actually said an actual crisis will actually happen, not just might happen. The ultimate crisis needed the ultimate warning. For your DEBATE on wheather changes and the way to “take more money off the people”. Just use HAARP to the full for it can change the weather to any mode that you want. Or, America can close down the whole HAARP project and let us have “natural” weather patterns and learn how to cope with that, for a change? It seems to many people now, that the change in our weather is indeed “man made” just to extract more money off the vulnerable people. Hi Anne, did you mean HARPIC? – good for cleaning bogs – “extract more money from vulnerable people” which ones did you have in mind dear? As for the other comments – I tend not to feed denier trolls and thus will pass over their comments in silence. In summary: Conspiracy theorists = 5 year old children (or perhaps people with too much time on their hands). Wow! So you are calling the 35 page Report from the EU Parliament itself, “Conspiracy theorists” that 5 year old children might take in? I chose the EU debate from the many, many pages I have on this subject to show that I do not hold with some peoples theories on HAARP. To learn Mike, you need to keep an “open mind”. So you are trolling here again? There is no man made climate change going on. There is not a shred of proof presented to support the claim there is. Even IPCC’s own RP, the Indian railway engineer, has admitted they can not point to any climate change in line with the predictions. There is no need for you to yell conspiracy fantasy just because we sceptics point out that opportunists agree with the alarmist message just to make money off fools. If you don’t believe me, why not listen to an expert who explains it in terms so simple you or any ordinary MP should be able to understand. Thanks a lot for discussing this matter. I concur with your conclusions. The points that the data stated are all first hand on actual experiences even help more.